Before I get to the award itself, I just want to thank every one of you for taking the time to vote. There were more than triple the votes sent in this year as in 2017, so we can be sure that the winners really do deserve their plaudits. You are the reason why these awards are so exciting, so thank you, thank you, thank you! Here it is then. We've come to the final award for 2018 and it's the big one. As well as collecting votes for each category, I also gave you the chance to vote for the one system, service, tipster or product that you rate as the best of the very best. This award has been dominated recently by Goal Profits, which won in 2014, 2015, 2016 and 2017. All the votes started again at zero this year though, so previous history is just that.. history. So.. which product collected the most votes from LB&GR readers in 2018? I was amazed last year when Goal Profits won just over 40% of the total votes in this category, but this time around it's an even bigger number. 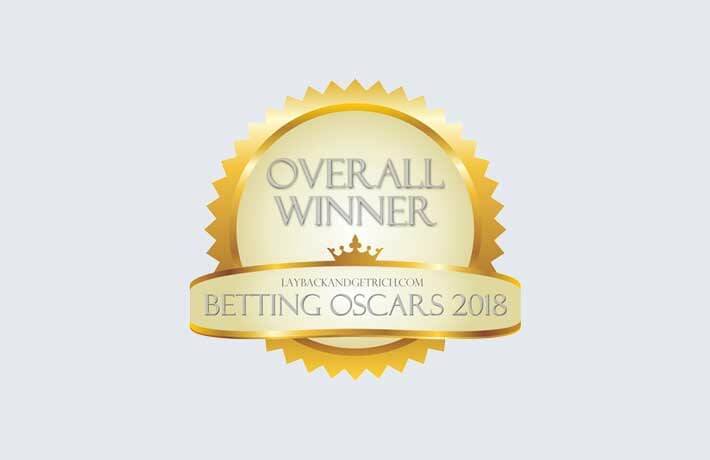 The overall winner of the Betting Systems Oscars 2018 is..
A staggering 64% of Lay Back readers voted for Goal Profits as their "favourite commercially available betting product or service" which is a truly astonishing proportion of the total votes. To put it into context, Trackside was in second place with 7% of the votes and OddsMonkey was 3rd with 3%. It wasn't even close. So it seems that rather than encourage some competition in this industry, the continuous innovation from the guys at Goal Profits is keeping them head and shoulders above all else. To be honest, I can't argue with that as I saw for myself during my Goal Profits review that it's a brilliant set up and I have to agree with everyone who says that the support from Steve and Kevin is second to none. Back to the award though.. was Steve happy with his 5th win in a row? Erm.. yes! Here is the Betting System Oscar acceptance speech for the 5-time winner! "Wow! Thank you Amy and all of your readers! This is amazing!" "We have invested a large amount of money this year in the development of our trading tools. Our Live Trading Module has proven to be a massive hit and I am already working on improvements and additions to make it even better. Trading with Team Stats and the LTM together is extremely powerful and proving to be very profitable indeed." "We've also brought a new team member in whose sole job is to look after members. While Kevin and I are on hand to answer questions a lot of the time, we can't be online 24/7. Having Paul to help us means that members get all the help they need even faster than before." "Paul is also happy to answer questions that anyone has before they join. If any of your readers have doubts about joining the best football trading community on the planet, please ask them to get in touch with Paul through the contact form at Goal Profits and he'll be able to help." "Finally, we're very happy to extend the exclusive deal to your readers. We love helping frustrated gamblers become successful traders and we'll continue to help everyone as much as we possibly can over the coming years." Congratulations once again to Steve and his team! I don't know if anyone else is ever going to challenge Goal Profits for this award. Perhaps they deserve some sort of permanent honour to give everyone else a chance? After all, the World Cup is given to a country for winning it 3 times! That would certainly take the gloss off it though. I mean, an award for being 2nd best seems a little pointless. Let's get some competition going people and give Goal Profits a good challenge in 2019! Steve mentioned an exclusive deal during his acceptance speech and here it is! At Lay Back only, you will get 2 months for the price of 1 when you join Goal Profits. Steve says that this deal is for new members only and that (at the time of writing) it is not available anywhere else. You will get full access to absolutely everything in the members area for a full 2 months so that you can get trading and see for yourself why Goal Profits wins so many votes from LB&GR readers year after year.